Businessman, restauranteur and world-famous chef Jean-Georges Vongerichten has collected awards like others collect stamps. Born in Alsace, and trained in the South of France, he also spent some time in Asia, developing a passion for flavours and textures, and developing his signature “vibrant cuisine”. 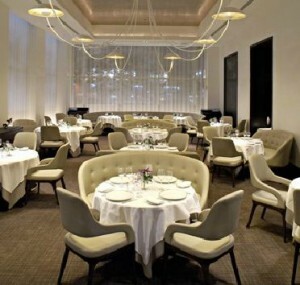 The elegant dining experience of Jean-Georges in New York, with a neutral colour palette, and views of Central Park, sets off the sophisticated menu to perfection. Type of cuisine: Asian Fusion. Location: 1 Central Park West, New York, NY 10023. Opening times for lunch: Monday – Sunday 11.45 to 2.30pm. Opening times for dinner: Monday – Thursday 5.30 to 11pm, Friday – Sunday 5.15 to 11pm. Prix fixe (choice of 3 dishes): £69 ($US 108). Dinner Tasting menu: £108 ($US 168). Lunch (2 plates): £24.5 ($US 38) – each additional plate £12.2 ($US 19). Lunch dessert tasting menu: £7.7 ($12). Individual style and fresh ingredients. Japanese Snapper Sashimi, Duck with Cracked Almonds and mango lassi with carrot froth are recommended by Zoe Beckham. For prime dinner times, make a reservation at least three weeks in advance. Service a little aloof, but efficient.